Venison No-Hides contains muscle meat that is high in protein and B vitamins. It is preservative-free with no growth hormones, steroids, or other fillers. Venison also includes a good amount of B vitamins, zinc, and phosphorus. Venison is low in sodium and a very good source of protein. All of these are important parts and beneficial for a healthy dog chew. Venison is in a class of its own, simple divine and your dogs will love it! Our pledge to you is this: No-Hide Venison Chews are always made from Free-Range Grass-Fed Venison. No chemicals, additives, bleaches or formaldehydes. 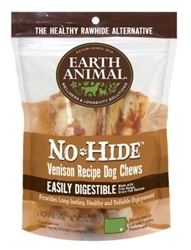 No-Hide® Venison Chews gives new meaning to dog chews. Try the healthier alternative today! We always suggest giving No-Hides or any chew under supervision. Keep an eye on your pup while they are enjoying the chew! Let the No-Hide Nirvana begin! INGREDIENTS: Venison, Brown Rice Flour, Agar-agar, Organic Eggs, Olive Oil, Banana Powder, Bromelain.